These words were written on a wall in Babylon thousands of years ago during a party thrown by King Belshazzar by a hand that appeared out of nowhere, telling the King that he had been assessed by God and found wanting. His judgement was coming because of being arrogant and his kingdom would be divided between the Medes and Persians. A modern extrapolation of this passage would be that the days of Chagwa’s reign are numbered and brought to an end. Chagwa has been weighed on the scales and found wanting and his kingdom is divided and given to the MMD (Medes) and UPND (Persians). Many Zambians have defended him saying that he inherited the current problems from late President Michael Sata. It is however interesting that many of the same people saying this also vigorously defended Mr Sata as a man of vision for his so-called “unprecedented infrastructure development programme” which has been a conduit of corruption and has severely indebted the nation. If President Lungu truly cared about his people, he would have by now been seen to be working hard to fix the mess created by his predecessor. Instead, he went on holiday in his first week in office and left the ball with Vice-President Inonge Wina who did not even have time to get used to her new job. For most of his presidency, Mr Lungu has been globe-trotting, enjoying himself and scheming how to borrow more Eurobonds and spend them. increased to record levels on his short watch. His words and actions are ever at variance. He preaches national unity but allows his PF Party Secretary-General Davies Chama to insult Tongas with no consequences and he sends his attack dogs Chishimba Kambwili and Mumbi Phiri to do his dirty work of attacking his political enemies. Kambwili has also recently joined Chama in insulting Tongas and we wonder whether Chilufya Tayali has become Lungu’s latest vuvuzela. Mr Lungu claims he wants to eliminate waste in government but proceeds to create five new ministries which will cost K500 million to set up and run for a year (by our own estimates) and chartered a whole plane to the USA at a cost of $300,000, not to mention the costs of fuel and fees for the aircraft, accommodation, allowances, Per Diem, etc. All this at a time of great economic turmoil with the Kwacha breaching K13 to a Dollar. Observing the unfolding events in Zambia, one cannot help but feel growing tension and an escalation process quite similar to what happened just before the one party state under UNIP was overthrown between 1990 and 1991. In 1989, everything seemed under control but there was a growing sense of dissatisfaction among Zambians with the economy and the oppressive one party state under President Kenneth Kaunda. There had been a tsunami slowly forming beneath the surface of the ocean that eventually overran KK and UNIP when it was too late. As the famous adage goes, “Whom the gods want to destroy, they first make mad”. Dr Kaunda after ruling for almost three decades had become drunk and arrogant with power, to the point of calling his own people “stupid idiots” and ordering reporters who challenged him at press briefings to “shut up and sit down”. This eventually saw his downfall when Zambians finally said enough is enough in 1990. During that tipping point period, Dr Kaunda attended a football match at Independence stadium and had his motorcade pelted with orange peels by ordinary Zambians. The once mighty KK was shaken and exposed. He had failed the Zambians and overstayed. He was out of power within a year. Recently, President Lungu attended a football match at Heroes Stadium. 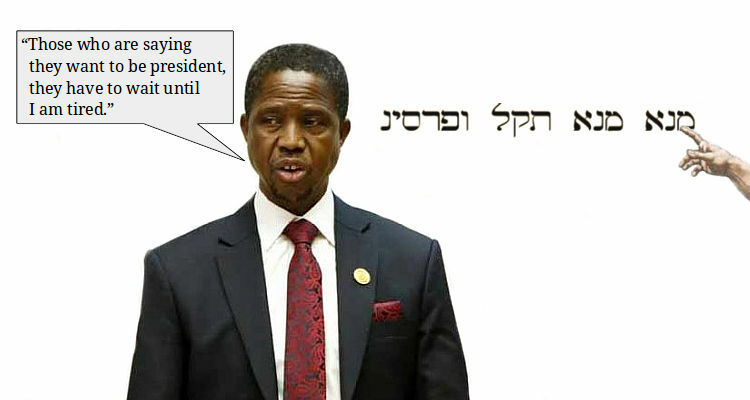 Luckily for him, there were no orange peels but he was instead booed by ordinary Zambians. Video footage of the event was posted on the internet by The Zambian Watchdog https://www.facebook.com/ZambianWatchdog/videos/1015170551867028/ and just as KK behaved, EL has ignored the event and continued as normal after sending one of his attack dogs to dismiss the story. It appears that history is about to repeat itself next year. When a sitting president gets disapproval at a public event like a football match, it is a signal that things are not alright and people want a change of government. It is a sign that people are fed up because he is not a listening president but pays lip service to the concerns of citizens. Of course we do not expect Mr Lungu to heed our advice or the concerns of the people since the gods have apparently done something interesting to him. He shall continue pretending to be listening while corruption, incompetence and arrogance reign supreme during his short two year reign. opponents like a ton of bricks. Another time, he boasted about having a small body but with a big engine. These are the words of an arrogant man who has been deceiving people that he is humble. But Zambians by now know his smoke and mirrors game. What we are seeing in him now is his true character. A leopard cannot change its spots. Whatever fancy things he says are irrelevant and we shall only be interested in his actions. This is why we were not impressed with his speech when opening parliament last month because we can already see what he is made of and we know that he shall be a colossal failure.